With great views of the mountains and the sea, Montara State Beach is a unique location for a beach wedding ceremony. Directions: On the San Francisco Peninsula in San Mateo County, approximately 20 miles south of San Francisco. 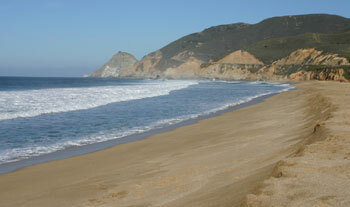 The beach is located eight miles north of Half Moon Bay on Highway One. There are two beach access points from the bluff area. One access is across from Second Street, immediately south of the La Coastanera restaurant. The second access is located about a half-mile north on the ocean side of Highway 1. Montara State Beach can be secured by permit as a location for your wedding ceremony south of Half Moon Bay La Costranera restaurant is located here and make for a nice location to have your wedding reception after the ceremony. Montara State Beach Web Site with link to panoramic views.